Quest Staff Stand Strong & Vote to Strike! Formal documentation was provided to the Labour Relations Board today regarding Quest employees’ strike vote. 67% of participants voted for strike action. This is not a 90% vote, but it is not a 50% plus one vote either. This is a substantial majority. The strike vote has another enhanced significance as well. The employer made attempts to manipulate the process. First the employer tried to exclude women on maternity leave from voting. The union argued that was discrimination based on gender. Quest management retreated. Then they argued people who are on independent contracts should get to vote. Then they retreated. Then they argued that disabled workers who are on long-term disability should not get to vote. It was painful to watch a school that takes care of children with disabilities try to deprive workers with disabilities of their rights. Union lawyers were prepared to argue that they were discriminating based on disability, a serious human rights violation. Quest management again retreated. Quest employees have spoken through a democratic process. We ask that all respect the decision of the clear majority. 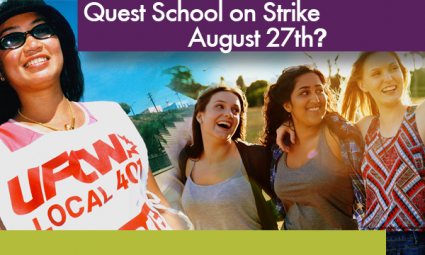 It does not matter if you voted ‘no.’ It is time that you join in solidarity with your fellow Quest staff, and pursue a fair Collective Agreement. In Quest’s 30 year history, this is the first time that the staff have joined together to say that they matter. At times the school has felt like a sea of gossip with each individual being played off of each other. Staff have been divided and conquered. But a “Union” as the word suggests, represents a unification of employee interests and energy. Congratulations to the Quest staff for showing the courage of their convictions. The time for harsh debate has ended. It’s time to focus on achieving a fair Collective Agreement and a better Quest without a dispute of any sort. Bargaining is scheduled for this Monday and Tuesday (Aug. 24th & 25th), and on Wednesday the staff will have a critical decision to make. At that meeting we will have a vote regarding whether or not the staff will take what Quest has to offer or will actually go on strike. As part of our on-going communication with the new NDP Government, we have advised them that Quest has refused to agree to binding arbitration. We continue to ask the Alberta Government to intervene to bring Quest management to their senses. We recently sent you a copy of the union’s offer of settlement and the employer’s offer of settlement. Please become versed in these issues, so you can make an informed decision on Wednesday (Aug. 26th). If you have any questions about the documents we are happy to discuss them with you. We will repeat again the information regarding next Wednesday’s meeting. Please attend one of these meetings.